Talk about a big start to the day! After taking second in the Emerging Elite 60m dash prelims to ATL Zoom (GA)'s Trinity Rossum (7.50), Buford (GA)'s Kimberly Harris improved upon her prelims time by a tenth of a second to take the win in 7.45 seconds. 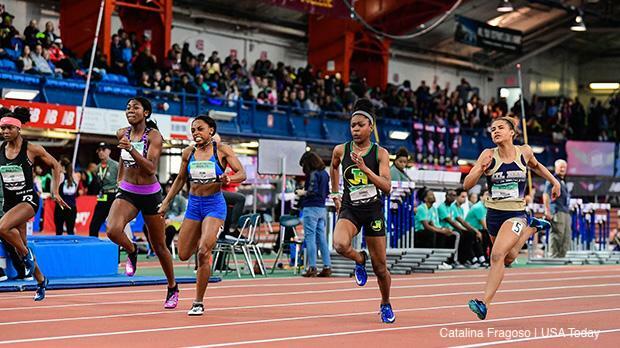 Harris has already kicked off her outdoor season in Georgia, but traveled up to New York to shatter the old Emerging Elite record of 7.49, last set by Semira Killebrew in 2017. Del'nique Penn (Parkland, NC) took second in 7.54 and Rossum was third in 7.56. Harris will be back for the championship 400 prelims on Saturday, bringing with her a 53.58 second indoor personal best and an 52.33 outdoor personal best. She will be a frontrunner to take home the national title.